[info] Follow your favourite Korean celebrities on Twitter! Fancy twittering? It would be a greater experience if you have your favourite Korean artiste on your ‘Follow’ list. Whether you are aware or not, more and more Korean artistes – BoA, Lee MinHo, Kim HyunJoong, WonderGirls, Park Jin Young, Se7en – join the Twitter community and we maybe seeing even more joining this merry community. 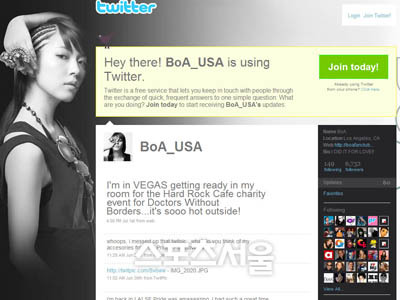 While the Twitter community get bigger, there is also a Korean version of Twitter launched called me2DAY (http://me2day.net/). Over at me2DAY, there are also accounts set up by 2NE1 members for fans to follow their updates throughout their day. With all the stars joining the friendly community, things just gets more exciting isn’t it? Anyway if you happen to know more to add to the list above, do let Sookyeong (add me too! lol) or the readers at KBites know too! 2 Responses to "[info] Follow your favourite Korean celebrities on Twitter!" Y they dun wanna use FB? LOL!